5'1 is the new 6'2: Primark, Lush & Boots, Oh My! Today was the day I inadvertently went shopping! - As in with no true intention at all got a lil' haul of fashion and beauty goodies! I did have every intention to just window shop and have a browse, but that never happens now does it? Plus it is nice to start the month off with new things now isn't it? This is what I got - excluding the clothing I acquired and all in all I'm damn happy with my little haul! We started by having a browse at the new collections in Lush - I'm loving the Valentines day range as the Willow Pattern is one of my favourite stories EVER (I couldn't believe it when my chap said he hadn't heard of it - blasphemer!) I own the plates and I'll be quite happy if someone *wink wink* gets me a little gift set of it for valentines day! But I'd run out of all bubble bars and was on the outlook for a new shampoo - so that's just what I got! Plus I was ecstatic when the products I bought were on a 'Happy Hour Sale' - eeek - I LOVE Lush! The Comforter Bubble Bar - £4.75/I paid £2.99- I LOVE the Lush bubble bars o-they make my bath smell edible, my skin feel soft and it's all natural so my dry/eczema sensitive skin doesn't have to worry about hurtful ingredients. Jumping Juniper!- £5.25/I paid £3.25 - The Lush solid shampoo's have proven themselves time and time again as an important hair rescue for me and I don't think I can really go back now! Plus this on is for greasy hair - which mine can get easily and is also gentle on sensitive skin and colour hair - bonus! Shampoo Bar Tin - £2.50 - Pretty Self explanatory really, Rob got me it to keep my new shampoo in as our pup Charlie is really in to trying to eat them! It even has a TAIL!!! Pink Studded Jumper - £8 - I'd been after a girly jumper for a while so when I came across this one I was pretty chuffed to see my boobies fit in an 8! Though I think a ten may have been better for them - but I loved the girly pink and the pretty studs and stones it has on the shoulder! After this a Spoons lunch was needed then we headed to Boots - as I decided I needed some nail varnish remover, and I clearly came out with more than that! Hair Donut/Ring - This isn't from Boots, it was from that lil' jewel Primark - but I was in dire need for a new large one after my pup ate my last one! Boots Exfoliating Gloves - £2.69 - I like to regularly re-stock these as they can get a bit ruined easily, plus these ones are cheap as chips (excuse that over used phrase!) and last ages - as long as my pup doesn't get his paws on them! Boots Straight Tweezers - £1.80 - I lost my really awesome Sally Hansen grip pair and needed a fill-in pair until I found some awesome ones - plus for bog standard tweezers they're pretty damn good! Don't tell me you're not dying to read about Taylor and Harry post-break up - give me the Goss! Pretty self explanatory, I love my glossy's, horoscopes, 'Men Overheard', Gossip and more, what's not to love? And this Elegant Tough Nail Remover is AWESOME if you're partial to falsies now and then and you hate glue residue -plus it's only £2.65 for 200ml! - Bargain! 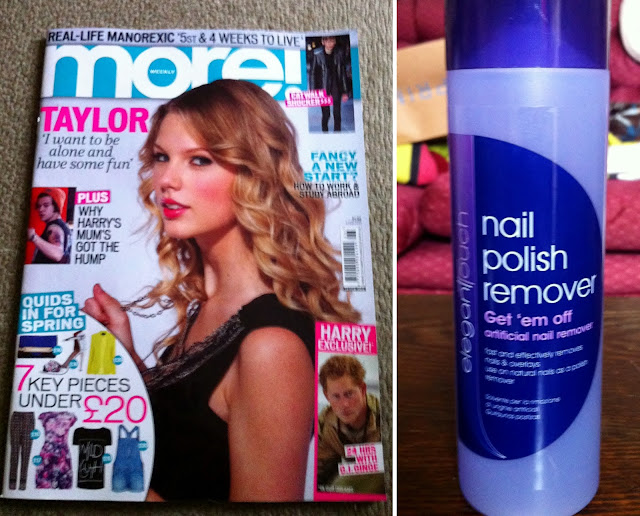 Models Own Nail Polish - Bloo Blo - £5 - I ran out of my Rimmel Sweet as Sugar and went to find it, what happened? I stumbled across this baby just the same (nicer) and buy one get one free! Models Own Nail Polish - Snow White - £5 -To match my lovely pale skin - and I was in dyer need of a new white nail varnish to put under my nail transfers so I couldn't resist a bargain! Balmi SPF 15 Coconut Lip Balm - £4.99 - Balmi is a life saver to me in winter I've had it before, and never clicked with the mint flavour, but after getting this little keeper it's soon become my favey due to it's coconut flavour is to die for! Plus, it's so handy to put on my keys as I end up losing them otherwise! Once again showing my support for Comic relief by sporting one of their designer products, this time it's the Emma Bridgewater Bag for Life for £9.99 (Over £4 goes to charity!) as it's seemed a must - as I'm a bit of a 'Bag for life' freak (I care about the environment!) I have so many from Harrods to Primark and now I have this fabulous one that goes to a good cause! I already have about three t-shirts on the way from the Stella McCartney Comic relief and the noses, so what's life without another bag? So that's my unintentional haul! I really did try NOT to spend anything and just window shop, but I couldn't resist all these wonderful things once I got going! I would recommend any of these products to you - especially the Balmi if you suffer in winter like me and the onesie, well because, hmm, because they're just damn awesome and EVERYONE needs a onesie! I would love to know if any of you have or have had these products and what you thought of them and if you recommend any more! Have you had any inadvertent hauls lately? What a brilliant haul! I love that onesie:) My balmi lip balm is attached to my car keys and has been such a life saver this winter! I'm just as bad with window shopping - I just can't do it! You got a lot of great stuff. 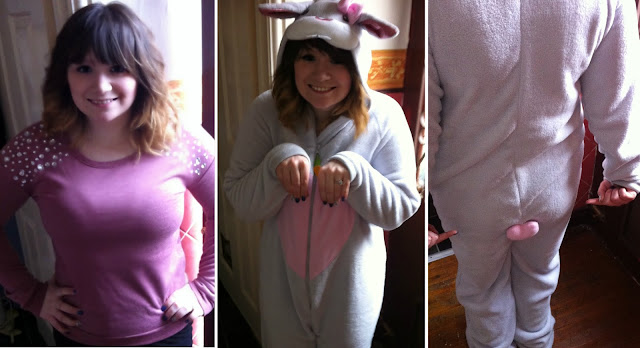 I adore that cute bunny onesie! So so so cute! i love lush products! i wish i shopped there more! I love onesies! That one is great. I still want to try balmi and models own polishes!